A neighbor shared her delicious pumpkin-bread recipe* with me thirty years ago. It’s a great one to bake ahead and store in your freezer. It makes 14 large muffins, 12 mini loaves, or 2-3 large loaves. When your guests leave, give them a mini loaf from a basket set by the front door. 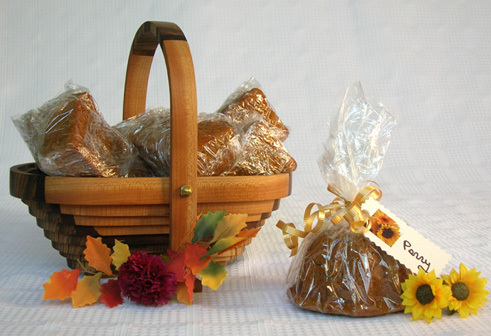 Or use the small bundt-shaped pumpkin bread with a name tag tied on it as a place holder for your dinner table. Thinsulate insulated Tea Tabard and Kup Kap to hold in heat. Invite a friend over, brew a teapot of tea or tisane, and cover it with a Tea Tabard (tea cozy). While you visit, the tea cosy and matching Kup Kaps (cup lids) on the mugs will hold in the heat. Enjoy a plate of your freshly baked pumpkin muffins and pecan pie pastries from Boonzaaijer's Cakes & Pastries in Colorado Springs! Stir in 12 ounce package of Ghirardelli semi-sweet chocolate chips. Spray pans with cooking oil. Check for doneness with toothpick. A great recipe to freeze.